The title alone of this week’s “Blacklist” only promised great things: the focus was Tom Keen, (Ryan Eggold, “90210”) Liz Keen’s (Megan Boone, “My Bloody Valentine”) betraying, secret-agent ex-husband. When we last left Tom, he was in Germany punching people and getting tattooed, while Liz faced a criminal investigation for the murder Tom committed. Ballistics matched the bullet found at the crime scene to Liz’s gun. She’s in trouble! 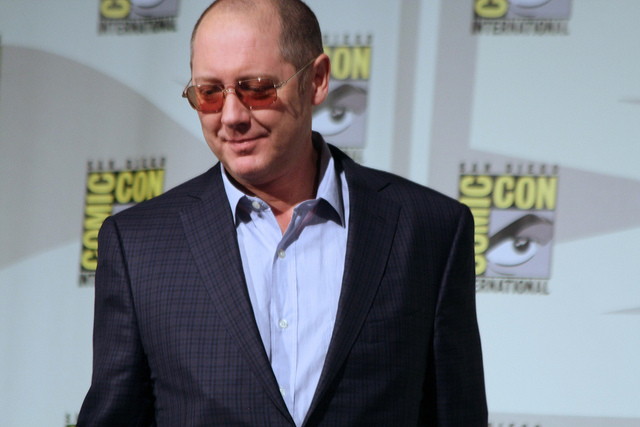 Raymond “Red” Reddington (James Spader, “Secretary”) reveals to the FBI team that Tom is alive and hopes to bring him in to protect Liz’s innocence. He and Donald Ressler (Diego Klattenhoff, “Homeland”) head to Germany to find Tom. Everyone is #TeamLiz! Assistant Director Harold Cooper (Harry Lennix, “Man of Steel”) admonishes Liz because he perjured himself on her behalf. In the midst of the confrontation, Lennix begins to bleed and collapses. At the hospital, his wife, Charlene (Valarie Pettiford, “One Life to Live”) reveals that Cooper is suffering from a brain tumor. Reddington and Ressler find Tom, who initially resists their pleas; he escapes amid gunfire in a drug deal gone wrong. Tom calls Reddington and the two have a heated discussion about Liz’s safety. The tattoo artist apparently did not ink black over Tom’s heart, because he arrives at the courtroom just in time to confess his guilt for the murder of the harbor master. Cooper survives his seizure, and he and Liz make amends. Liz is cleared of all charges on claims of national security, thanks to interference from future Attorney General Tom Connolly (Reed Birney, “Girls”). What does “The Blacklist” say about federal oversight and the consolidation of intelligence agencies? Also, Tom was mysteriously released from custody, again thanks to some combination of Reddington/Connolly. Reddington and Liz have another weirdly paternal talk, and the questions just keep piling up. Only a few episodes left in the season, and I’m hopeful that we’ll finally begin to get some answers! * I didn’t think any look would top Tom’s normcore glasses/plaid, but I was wrong. I think Tom in a leather jacket might be hotter than Tom in glasses. * Mini-workout montage for Tom! More sit-ups, please! You’re competing with Scott Foley for top babe in this timeslot! *With Cooper angrily confronting Liz then passing out because of his illness, I fear that “The Blacklist” is nearing soap opera territory. But it’s all good. I’m here for the drama. *I’m still in love with Tom as much as Tom is still in love with Liz. Or as much he is acting in love with her to save her? Trying to navigate the emotional manipulation and motivations of this show is intense, especially after their phone call in the closing moments. *Liz starts a scholarship fund for the harbor master’s daughter with money she received from selling the apartment Reddington bought for her. Sweet or cyclical? Tune in to “The Blacklist,” Thursdays at 9 p.m. on NBC.